We had another somewhat early tour so we ate at the buffet for breakfast. 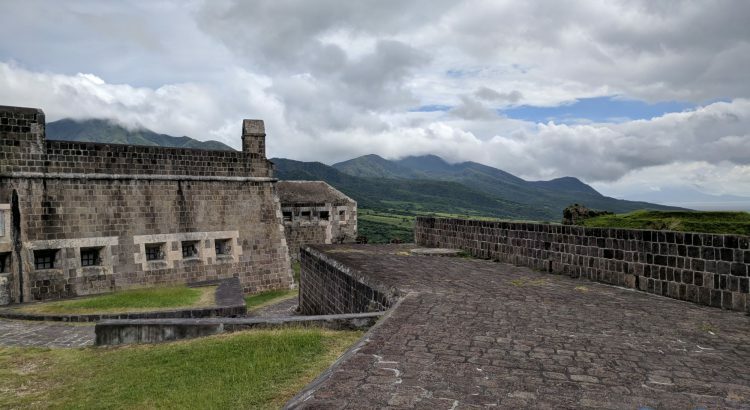 We had been on St. Kitts earlier in the year but we went directly to Nevis from the airport. So for this trip, we decided to see what St Kitts was like. We got off and easily found our tour which was the “Grand Tour of St Kitts” operated by Thenford Grey Tours. We boarded the bus and then started driving around the capital of Basseterre to see some of the sights from the bus. We had Thenford Grey himself as our tour guide. The first stop was at the Romney Manor gardens which was a former plantation. We spent a little while taking in the gardens and seeing how Batik is made. Batik is a type of dyed fabric with intricate patterns and designs. The next stop was at the Brimstone Hill fortress which was very interesting with sweeping views of the island. After a brief introductory video, we walked up the steep path to the main fortress area. There were a few displays here, but the main attraction was the wonderful views. The safety features on the fortress left something to be desired with many long drops without railings or anything. It is always interesting to see the different approaches to safety as compared to the United States. We then drove to an overlook where you could see both the Atlantic and Caribbean. There were also a bunch of food stalls and photo opportunities with animals, including a Rastafarian donkey. The final stop was at Carambola beach where we were given the option of having about 1.5 hours at the beach or heading back to the ship. We elected to spend some time at the beach even though we thought heading back to the port at 3pm when all aboard was 3:30pm was cutting it a bit close. Thenford reassured us that it would be no problem and he does it all the time. The beach was quite crowded and relatively narrow. Snorkeling visibility was not that great due to somewhat large waves. I wouldn’t say it was the best beach I’ve been to, but it was fine. It all worked out in the end and we got back to the ship with 5 min to spare. Thenford Grey was a fantastic tour guide. He seemed to have limitless knowledge about the flora, fauna, and history of the island of St Kitts. I would highly recommend his tour for a port day in St Kitts. We came back and had a very late lunch. We then watched sail away and headed back to the room to pack. Due to the late lunch again, we went to the show before dinner. We made a stop for some cocktails at the martini bar. After dinner, we went up to the Sky Lounge to see the “Wonderland” show. It was pretty bizarre and you would not be missing out on much by skipping it.